. 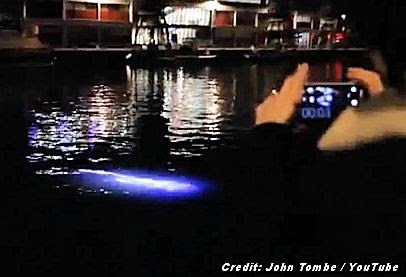 . . A mysterious video has emerged on YouTube from Tuesday night which appears to show a glowing “alien-like creature” floating in the waters of Bristol Harbour. The footage has been viewed thousands of times and caused a stir on Twitter and Facebook – and even the experts cannot agree on what it is that uploader John Tombe has captured on camera. 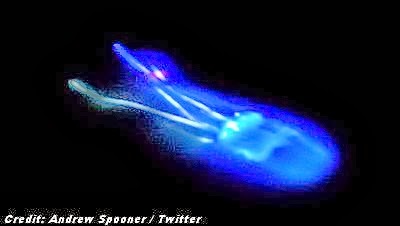 The squid-like being flashed brightly in the darkness for around half a minute, witnesses said, before disappearing – and has left experts at odds over what could have happened. Dr Steve Simpson, from the School of Biological Sciences at Bristol University, saw the footage and told the Bristol Post: “It's very intriguing - I don't really know what to make of it. . . .
Alien Creature Evokes Hair-Raising Fear For Texas Woman!